I'm not sure I can explain how excited I was to see a big bag labeled welches and my old friends red, purple, and orange staring back at me... actually, let me put it this way, I was so excited, I grabbed the back without actually reading what the flavors were. Not that I really needed any additional motivation, but the big price tag over these bags said "limited edition", so I knew it was now or never to try these. Wait? What? no... no no no no. White grape with cherry flavor? White grape with tropical flavor? No, no no no. These aren't my pops!! Ohhhhh the disappointment!!! White Grape with Natural tropical flavor tastes like...pineapple maybe? this flavor is super mild and the label just says "natural flavors"
I love how they keep mentioning "natural flavor" considering that these bad boys are laden with sodium benzoate and potassium sorbate. Their regular juices don't have these, so I'm not sure why they are showing up here. Notes: There are 40 concord grape pops (45 calories), 20 tropical (40 calories), and 20 cherry (40 calories) in the bag. It's just juice, so there's no fat or anything like that. P.S. If anyone knows what happened to my beloved sugary welch's pops, please let me know, thanks! I LOVE THESE ICE POPS AND CANNOT FIND THEM NOW. HELP!!! I loved the grape popsicles that came with two sticks, all grape in the box. Maybe I will try the Dryer's that Sister Sue recommended. Do you have a Dollar Tree in your area? 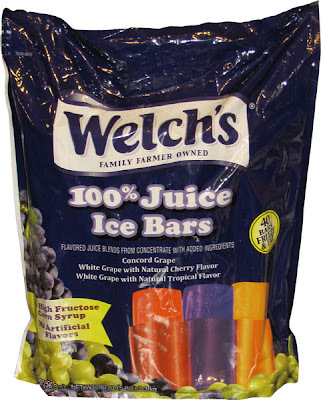 Our Dollar Tree sells the sugary Frozen Welch's Grape Juice Bars.